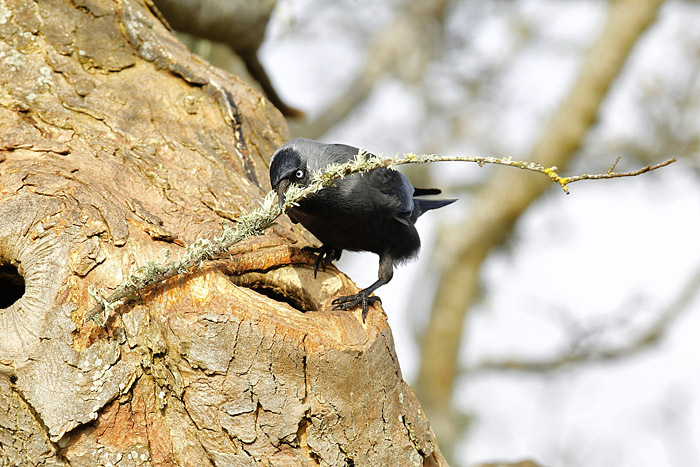 For the past few weeks the jackdaws in my garden have been very vocal with their loud ‘jack, jack, jack’ calls and there has been a frenzy of activity around the various nest sites as they, at first, squabbled over the prime des res and then began to build their nests. 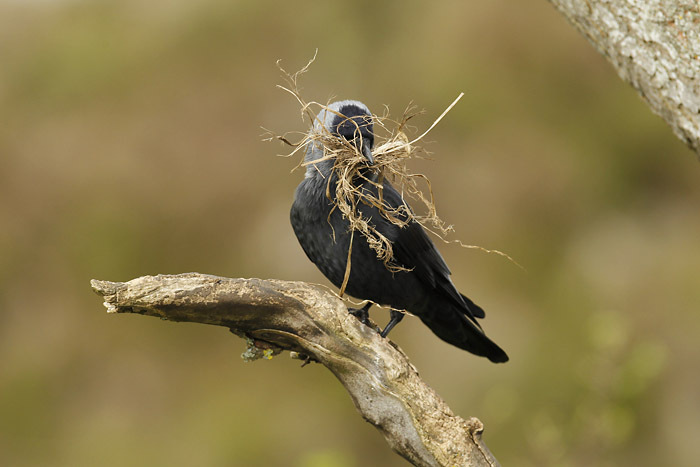 The story really began when we bought the house, which was then an empty old farmhouse, to find a massive heap of sticks in the two fireplaces – the work of jackdaws dropping would-be nest material down the chimneys. It took several barrow loads to remove them after which we fitted wire netting! Soon afterward, I erected a tawny owl nest box in the far corner of the garden in a large old tree, which was immediately commandeered by jackdaws and has been used by them ever since – so they were re-homed successfully! A couple of years ago a pair began investigating a smallish hole in another tree but I think the cavity was too small at the time to allow them to nest. But jackdaws are quite strange in this respect as they seem determined that if they look long enough at it and keep sticking their heads inside it will miraculously become suitable! They have done the same this year at the entrance of a starling nest box, which has a hole that is obviously too small for a jackdaw to fit through. Nevertheless, a pair (possible inexperienced in the finer points of nest choosing) kept trying to get in for more than two weeks. This year two other holes have ‘developed’ in the old tree and this has attracted no less than 3 pairs of jackdaws to investigate with several scraps breaking out as they vie for the top spot, which it turns out is a new hole further up. The pair winning the right to nest here seem to pretty switched on and have methodically collected twigs, dry grass and bits of wool to make their nest. The other pairs have done a lot of ‘sticking their heads into holes’ but despite managing to drop a good number of twigs inside their respective pads, I’m not convinced they are nesting. It took a little while for the birds to work out how to get a 60cm+ twig into an opening with a diameter of no more than 10cm but after some amusing attempts they came up with a technique of shimmying their beaks along the twig so that it was held at at very end and then they could enter the hole and pull the twig in all in one movement. After clearing most of the garden of wind-blown twigs, and adding the soft furnishings things have all gone quiet and I suspect that they are now incubating eggs. Things will hot up again in a few weeks when the growing chicks begin to noisily beg for food. 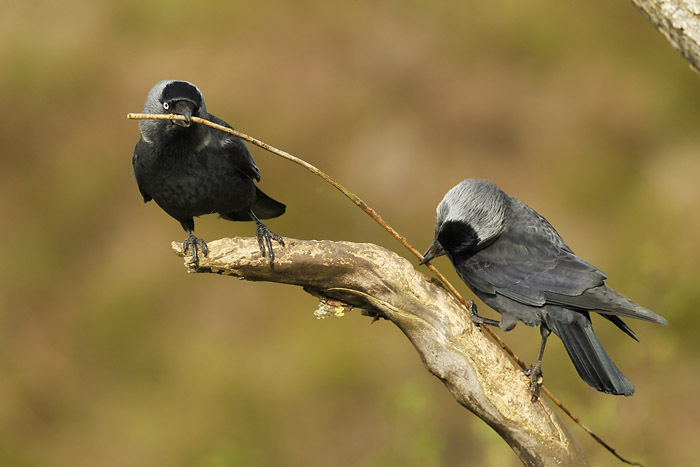 This entry was posted in In the field and tagged jackdaw, nature, photography, wildlife. Bookmark the permalink. 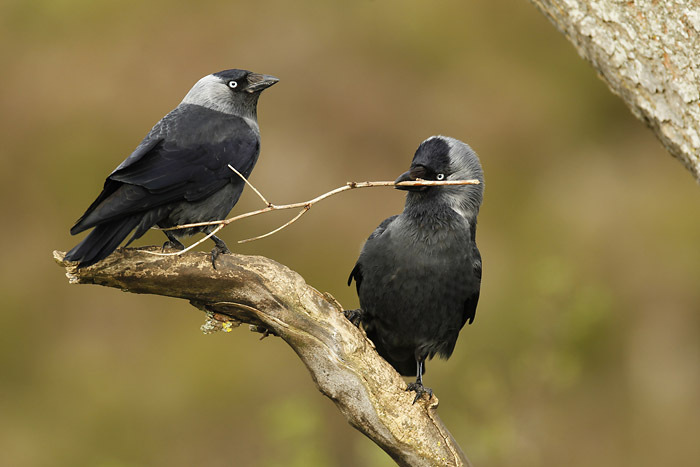 2 Responses to Jackdaws – setting up home. Some lovely shots. I always feel jackdaws don’t quite get the recognition they deserve, especially with that beautiful pale eye and their collaborative intelligence. It’s a treat to see an example of their ingenuity in nest building. I had to extract one today from a chimney (with the front sealed off) that had managed to slide all the way down to the shoulders of the fireplace, an occasional occurrence at the office. What was really interesting is apart from some bits of nesting material were a good number of wild walnut shells in the fireplace. They had obviously being using the top of the brick chimney to crack the shells! I’ll look forward to seeing some images of the young. I have had jackdaws take over both my tawny boxes and they are looking in my two kestrel boxes too! Very animated characters though and great to watch. Fantastic shots you have taken and lovely light.